We are deeply concerned about the recent trend of drastically discounting shelter animals, or simply giving them away. While we see the benefit of drawing attention to animals in need of homes, and appreciate that these policies result in some animals finding good families, there are dangerous flaws in this approach. Our concerns are for both the animals themselves, and the effects these increasingly frequent practices may have on adoption rates over time. From a business perspective, does price cutting work? Ask a retailer. Although it may increase initial sales volume, it changes consumer behavior, expectations, and product perception. As promotions conclude, some will put off adopting, anticipating a future bargain and causing inventories to build. The “product” in question, shelter pets, may be devalued in their minds, and further distanced in status from animals bred and marketed for profit. Still, might it not be worth it to suffer these changes if they clear out the shelters? Assuming all pets went to responsible homes committed to their welfare, and that shelter populations would remain at significantly lower levels where supply and demand were well balanced, perhaps. But that is not the case. The dangers of giving animals away for free are well known. Finding good homes is challenging, and the most dangerous people seeking animals are often practiced at deception. Others are well meaning, but unprepared. While private shelters are able to screen prospective adopters, many municipal shelters, such as Los Angeles City and County facilities, now featuring ASPCA grant-funded free cat adoptions, are not. They are simply handing out free cats to anyone who asks. As for lowering shelter populations, until we stem the tide of incoming homeless pets, reductions will be short-lived. On August 15, more than 400 shelters participated in a well-publicized national initiative. “Clear the Shelters” was a huge effort involving thousands of people, and accomplished 19,142 adoptions on one day by drastically reducing or eliminating adoption fees. This is impressive, but consider another statistic: an average of approximately 20,000 dogs and cats enter U.S. shelters every single day of the year. So while shelters may empty out briefly, they will quickly fill back up. What happens then? Now the public is waiting for the next sale. Meanwhile, local rescue groups who consistently relieve shelter pressure by bailing out, fostering and rehoming shelter pets, are suffering. These groups are an important resource for shelters, taking on approximately 5,000 dogs and 2,000 cats annually from the LA City shelters alone. They must now compete with $20 adoptions. Nothing moves, no room opens up in their homes. 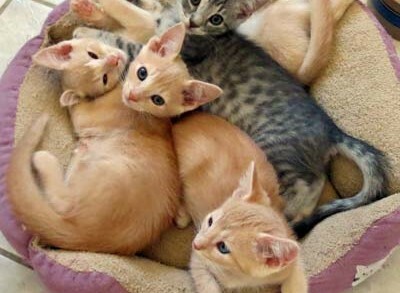 Not only can they not take on more shelter animals, they also cannot accommodate the myriad of kittens they are handed by the public at adoption sites. In the past they would accept these litters, arrange spay/neuter and vet care at their own expense, then attempt to recoup that seed money through adoption fees to continue their programs. This cannot be done for $20. So what will happen to these boxes upon boxes of unwanted kittens? Many will wind up at municipal shelters. If unweaned, they may be immediately euthanized there. Older kittens will add to the numbers awaiting homes. If simply turned away, they will be abandoned or handed out for free, unneutered, and begin reproducing at 4-6 months of age. Adopting an animal is a commitment, and requires thought and preparation—including financial. Impulsive, price-triggered adoptions have a higher rate of failure. Shelter returns may increase. Though “returned” can be a dangerous stigma for a shelter animal, reducing its future chances, he or she may still be better off than those who are simply neglected or given away. Yet with no significant refund involved, there is little incentive to return pets to the relative safety of the shelter. The number of homeless pets in our country is appalling. Their suffering is immeasurable. Until we effectively arrest pet overpopulation through education, legislation, and affordable sterilization, that tragic fact will remain. In the meantime, adoption spells salvation. Increasing it is critically important. Promoting it is crucial. But it should be done through programs that are sustainable. And it must be done in ways that preserve the dignity and the safety of these animals. Hi Kimberly- Please call our Spay/Neuter Hotline so we can help you find a resource near you. 877-772-9738.